What is American Tribal Style® (ATS®)? American Tribal Style Belly Dance (also known as ATS) is a modern style of belly dance created by FatChanceBellyDance® director, Carolena Nericcio-Bohlman. The primary defining characteristic of American Tribal Style Belly Dance is group improvisation. You can read more here. Do I need to sign up for the whole series? Yes. 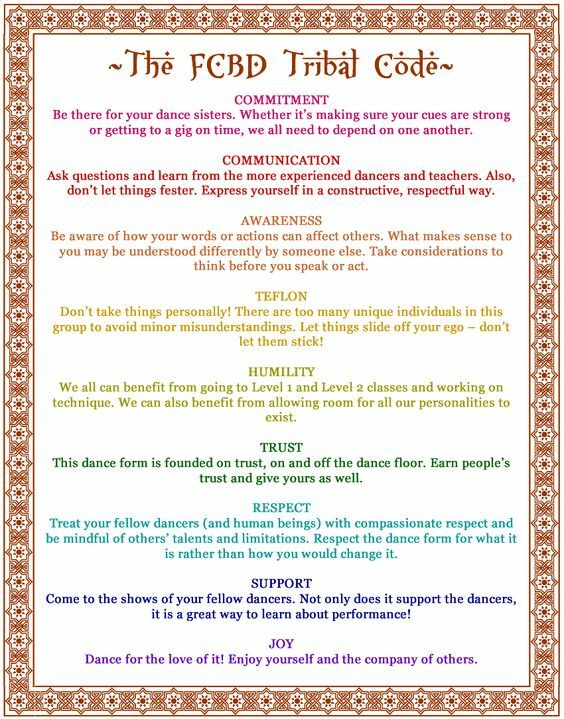 We do not allow drop-ins, since you will be learning an improvisational style dance vocabulary and each class will build on the previous one. Think of this as learning a language! The more exposure and practice you can get, the better! However, we understand that life gets in the way sometimes! Just let us know you will be missing a class and we will do our best to get you caught up! Because ATS is an improvisational style of dance, you need to have good control of the basic steps before you move on to steps that are more complex. Therefore, we recommend that you take Level 1 more than once. There is no shame in taking the same level class several times! We all learn at a different pace. Basically anything you feel comfortable in that allows your instructor to see your body. We recommend leggings and a form-fitting top (or a choli). You can also add a hip scarf to help you see your own movement. Make sure you wear this on your hips, not your waist! Do I have to zil ? Zils, or finger cymbals, are fundamental to ATS. Once you start playing them as you dance, you become a musician, and we all know how long it takes to become one! Be patient with yourself and practice often. You can start by getting a cheap set, but you will eventually want to get better quality zils. We love Saroyan! Where can I get extra practice? We are available for private classes! You can use these to refine your skills or to make up a missed class. Virginia is a FCBD® Advanced Teacher Training graduate and certified ATS instructor with a very good eye for detail and with lots of experience. You can also buy the FCBD instructional DVDs Tribal Basics Series (Volumes 1 and 4 for Level 1, Volumes 7 and 9 for Levels 2 and higher). Where can I buy costume pieces for my ATS wardrobe? Check out these sites that we love!